Calling all horse lovers...... The Born 2 Be four-legged therapists need your help! Program volunteers work directly with the participants and horses. Previous horse experience is not required: however, volunteers must attend a training session and be at least 14 years of age. Donations to Born 2 Be Therapeutic Equestrian Center are tax deductible. Make checks payable to Born 2 Be Tec. Thank you for making a difference in the lives of those we serve. Join icare.com - name Born2Be as your charity of choice. Join smile.amazon.com - name Born2Be as your charity of choice. Both sites donate a percentage of your purchase to Born2Be! to be able to link their card to an organization. 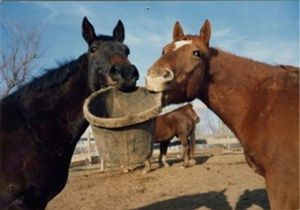 Donors to Born 2 Be Therapeutic Equestrian Center, may designate or "restrict" the use of donations to a particular purpose or project. An example is a gift purchase of a horse or tack, sponsor a student, etc. Unrestricted funds are donations that are available for Born 2 Be to use toward any purpose. Unrestricted funds usually go toward the operating expenses of the organization.